Having participated in bike patrol, I decided to talk to Walt Paciorek, an instructor of the program. Good events require a lot of time and organization led by dedicated people. Here is a way you can give back to a sport that has perhaps given you a great deal of fun. The information is Walt’s take on the program. The pictures are mine. The mission of Perimeter Bicycling’s Bike Patrol Program is to provide assistance, encouragement, and support for the participants of Perimeter events. Patrollers offer mechanical assistance, first aid as needed and encouragement to successfully finish the ride. Perimeter Bike Patrol is a group of nearly 300 certified cyclists who bring enthusiasm for cycling and a deep pool of experience to ensure the success of thousands of riders in Perimeter events every year. 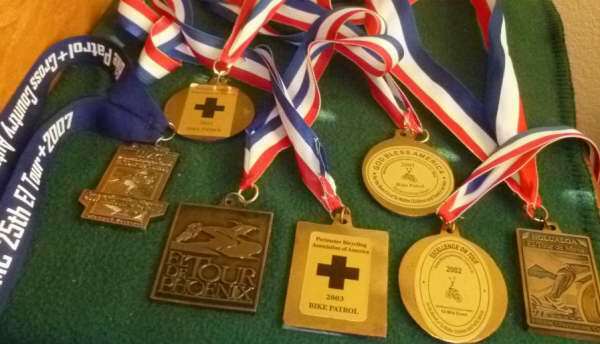 There is also an award for outstanding Bike Patrol in each event. And of course, all Bike Patrol receive a finisher’s medallion. The typical bike patroller is a fit, experienced, and enthusiastic cyclist with basic mechanical skills (fix a flat, correct a thrown chain); knows and practices the rules and procedures of safe cycling, and is willing to assist and encourage other cyclists. A basic understanding of first aid is helpful but not required. Different ride distances are available to accommodate all ages and sizes of riders. You ride at your own pace (preferably with a partner), but plan on many stops to help riders. For a modest processing fee you get to ride a great event, a striking yellow tee-shirt, a cool medallion, excellent sag stops, and a priceless amount of appreciation and satisfaction. While maybe not rock-star status, you will receive many positive strokes from those you help or who have been helped by others in the past. What do I have to do to qualify? can to ensure participants will have a safe and fun event. If you are uncertain about your qualifications, you may request to be paired with an experienced Bike Patroller or team. Review the Bike Patrol Manual (available on-line) before you attend the certification class. Classes are normally held several times each fall; and are held in both Phoenix and Tucson. How long do I have to be at the event? medallion, and then you are finished. A surprising number of riders will need your assistance. They appreciate getting back on the road promptly without a long wait for sag assistance. Bike Patrollers are the eyes and ears of the tour, ready to report or correct problems and assist with mechanical, medical, and motivational emergencies in real time. Do I have to provide tubes and tire-changing tools? You will be advised about what tools are useful at the certification class. You may receive a tube or two at packet pickup. Most riders will have their own tubes. A few will not. I always carry a few patched road bike tubes for those who need them and a glue-less (Park is the best) patch kit for odd-sized wheels. What are other duties of bike patrol? Assistance, encouragement, and support are paramount. Call in or text every time you stop to provide assistance, or at least at every sag stop. If you observe riders behaving badly or breaking event rules, ask them to mend their ways. If they do not cooperate, report their rider numbers and the circumstances via text, call, or at the next sag stop. There will be consequences. What do I do if I encounter a crash? Secure safety for any victims and, if serious, call 911. Provide any first aid that you comfortably can. Stay until help arrives or you are certain a rider can continue. Report the incident via text or call. Complete a report form for all but simple events handled on-site. There can be an events that will be challenging. Some examples I have encountered are hypothermia, hyponatremia, diabetic incidents, heat distress, and severe cramps. These are mid-level events that can be treated on-site if caught early, but can also require professional medical attention. You will make the call – treat, call for support/pickup, or call 911. What should I do to be prepared? Be sure your own bike is in good shape before the ride. Bring a fully-charged cell phone. Between the Bike Patrol Manual and the certification class, you will be prepared. Ride with a partner for fun, efficiency in carrying out duties, and assistance when needed. 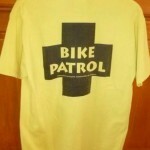 If you are interested in being a part of bike patrol, visit perimeterbicycling.com/bike-patrol to learn more and sign up.